No, I have not given up riding my bike. However, it has been nearly a week since I was on the saddle. Monday morning I took the bike in to my favorite bike shop, Sunshine Cycle Shop. Unfortunately, I needed to have quite a bit of work done. So, the bike was not ready for me until yesterday. Then last night my job called me away to a special convocation at Bob Jones University where the Chief Justice of the Fourth Circuit Court, William Wilkins, was speaking. You can read about it here. So, I had the bike, but I didn't have the time. Tuesday evening I ran so that I wouldn't lose the stamina I had gained. I discovered that the muscles you use for riding are not the same as you use for running! Still, my heart and lungs got a good work out so I think I will be able to thrash the trails without skipping a beat. Oh yeah, I had the wheels trued, the rear deraileur straightened, and the brake pads and shifting cables replaced. Ah, now I hear that sweet little "tick, tick, tick" that you hear when everything is aligned. Thanks Mike and the guys! More good news. I remembered that Mike played around with Lambrettas. Now, I learn that Mike is a Vespa dude. He'll be a good contact should I run into trouble with my motorized bike. I learned yesterday that my Vespa is supposed to arrive on October 17 to a warehouse here in Greenville. I'm not sure exactly what warehouse. The shipping company is Phoenix International and they tell me they'll give more information closer to the arrival date. The bike is on a boat right now and will be off-loaded in California. It will then be brought overland to Greenville. At least I won't have to worry about the boat sinking in a hurricane! I've been reading that more and more people are buying scooters. I even saw a piece in The Greenville News this morning (it isn't on their online site - here is the source of their piece). Two reasons for the upswing in sales: 1) gas prices and 2) the fun of owning the scooters. I started with later when thinking about purchasing a bike - plus the convenience of being able to get around a college campus and a crowded downtown area. Now, I'm seeing the side benefit of the better gas mileage. The downside is that you just don't see scooters around Greenville. Well, you do, but they are typically mopeds driven by someone you are sure lost their license or had their car repossessed. It will be very interesting to see the responses I get. Judging by how people respond now when I tell them I am getting one, I think the reaction will be mixed. Sitting at lunch last Sunday, I had to endure the ribbing of my wife's brothers and her sister-in-law. "Just make sure you don't go to any biker bars," they said. "Well, now I know what to buy the redhead for Christmas! One of those Kaiser helmets. I can't wait to see her sitting in the sidecar with that thing on!" Of course, the redhead has already announced she will not be seen in the sidecar with or without decorative headcovering. Hey, I expected it. That will be part of the fun - cutting across the stereotype. Besides, with gas prices the way they are, they can laugh at me as I go all the way to the bank. Tonight, the redhead was at play practice. She will appear in a November production of King Lear. The cast is in the middle of blocking the scenes, so the rehearsals can last some time. I took the kids to McDonalds and then brought them home to watch a DVD. Tonight's offering was Disney's The Love Bug. It was a nice change of pace for the guys who watched The Sound of Music with their sister the last time we let them watch a movie. This put it a little past their bed time when I finally got them settled down for sleeping. That is when everything went crazy! Once they climbed in bed, I went to straightened up the den. No sooner had I started than my middle child came into the room. "You are supposed to be in bed, young man," I said (knowing that this one tries to find all kinds of reasons to get out of the bed). "I have sand in my pants," he replied. "Well, take them off and brush them out." Obediently, he sat down and brushed out the inside of his pants. Off he went to bed. Once again I heard a wail from the bed room. I walked in. "I have sand in my bed!" child two whimpered. I just knew he was complaining about a tiny grain of sand. "Well, wipe it off and go to sleep." He started to feverishly brush his bed and I turned off the light. "I STILL have sand in my bed!" came the now frustrated voice from the room. I went in to see for myself. Sure enough, there was sand on the bed. I told him, "Get out of bed and let me do it." Brush, brush, brush... "There, now there is no sand on the bed." Back in he went. "There IS sand!" "There CAN'T be sand," I said now getting frustrated. "I just wiped it all off myself!" Sure enough, there was sand - loads of sand. It seemed everywhere he went there was sand. Finally, he stood still on top of the hope chest in the kids' room. There below him was a pile of sand! "How on earth!?!" I exclaimed. Then child one spoke up. "His pull-up is leaking." I looked closely. Sure enough, the filler inside child two's pull-up was just finishing pouring out onto the hope chest! I never knew that the absorbant material inside of pull-ups was just like small granuals of sand. I'm glad that we figured that out. I thought for sure I was losing my mind! We changed out the pull up and finally got child three to settle down by turning on the classical piano CD. Today I took my family to the Sky Top apple orchard. We had a great time. The kids just love it up there. Also, it seems like every time we visit we run into people we have not seen in a long time. When I got home I caught the last couple of minutes of the UNC vs. NSCU game. Can you believe it!?! The Tar Heels won! I am now watching the recording of the whole game while I am posting here on the blog. I like watching the recording so I can fast forward through the commercials and pause it to come back to it later. After dinner (we're having BBQ that we picked up at a little hole in the wall on our way back from Flat Rock. I can smell it right now.... hmmmmmmm. Hope the beautiful redhead calls for me soon! ), I plan to get back on the bike. Here is a map of my ride I plan to take. This will be my basic ride here until I get my energy back. Then I'll start expanding it and adding some extra laps. Click here to see a larger image. The yellow line is asphalt. 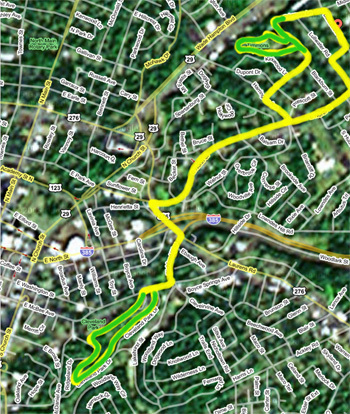 The yellow and green lines indicate single track trails. It isn't exactly correct. There isn't enough space to really show the single track - there is really more to it, but that is the general idea. Hey, my little girl just came down to the office to tell me it is time to eat! See ya later! I headed back on the trail today. I did a lap of Timmons Park and then headed down East North Street down to Cleveland Park. After doing a full lap through that park I headed back up East North Street back home. That first hill up from Stone Ave. heading toward Pleasantburg is a killer after about 6 miles of trails! My goal is to get back to doing several laps of Timmons, then going through Cleveland Park down to the Falls Park and the Liberty Bridge, then on through downtown Greenville, and up Wade Hampton Blvd. to home. That will be about a 16 mile workout that includes some technical single track. Timmons Park the way it used to look. One thing that shocked me was the condition of Timmons Park. I have ridden there for at least ten years. 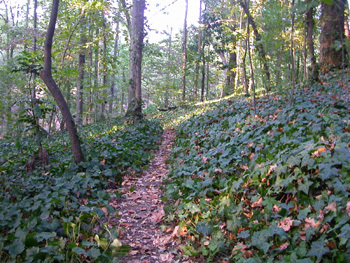 The trail has always been well maintained. The riders there (the trail is sponsored by the Greenville Spinners Bicycle Club) have done a good job of trail maintenance. However, the park is a mess - and it isn't because of the bikers. It is because of an unexpected challenge to the environment. What disc golf has done to the park. The people playing disc golf have caused a huge amount of erosion around the park. Some of the bicycle trail has completely disappeared. 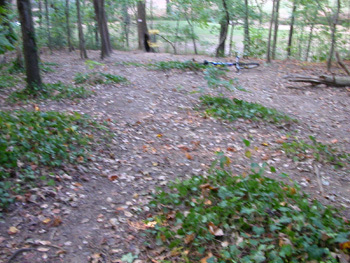 While the riding trails used switch backs and marked areas, the disc golf players walk all over the area destroying the undergrowth. A few good rains and there goes the hill side! Disc golf destruction - who would've thunk it? I went to fill up the Suburban today. I still had a quarter of a tank left after filling up August 31. 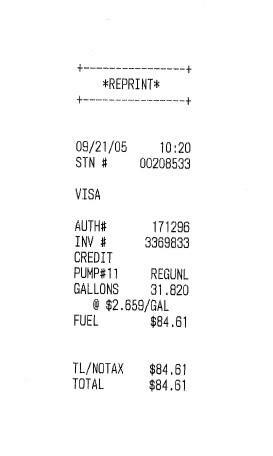 The price today was four cents less than that last visit to the pump. I figure I could have gone another week. However, Rita could cause prices to go up again. I hope to stretch this tank over a month. Maybe my Vespa will be here by then and I can really start cutting down on my gas consumption! My wife for sometime has been doing aerobic workouts. I can definitely tell a difference in her stamina and strength. No longer does she talk about a sore back and weak joints. She can swing up our little chunker two year-old without a problem. Unfortunately, I can't say the same for myself. I have not had an exercise routine for over a year. I can tell it too. The beautiful redhead brought it up the other night. "I'll be glad to do whatever you need me to do to get you back on your bike." At first I thought, "Great, one more thing to add to my schedule." But she was right, I needed to start doing something so that when my kids are teenagers, I will be able do active things with them. So, tonight, for the first time in ages, I got out my trusty Pro-Flex 757 (The brand no longer exists. It was bought out by ski maker K2.) and hit the trail behind my home. I used to do 12 laps of the relatively technical trail without a problem. Tonight I was happy to note that I hadn't lost the technique, but sad to note that after one lap I could tell I had been drinking way too much cream soda! But, I am back on. Help keep me accountable. If you notice that I don't bring up my bike riding very often, drop me a line and ask me if I have whimped out. Here's hopin' I've got what it takes. My lovely wife isn't so sure about the Vespa. It isn't so much the cost of the bike or the fact her husband has gone and got some new toy (though those things to factor into the situation), it is that she is embarrassed. She has it in her mind that we are talking about a moped. Around where we live people don't normally drive scooters unless they have lost their license - at least that is the perception that some people have. 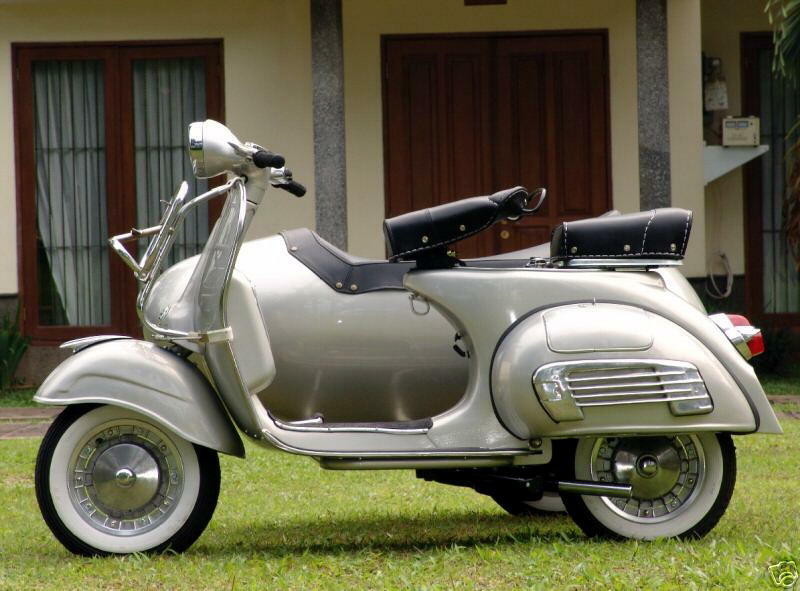 I'm trying to show her that it isn't the case with something as classic as this '64 Vespa. I'll grant that the side car adds a new twist! However, the side car can be removed. 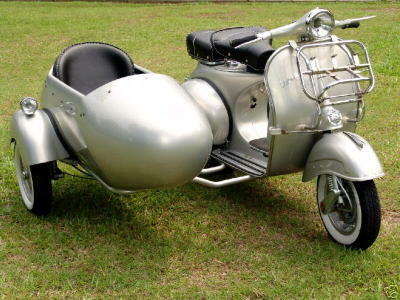 Then again, you might find a scooter in Greenville - but a scooter with a side car? It will certainly be a head turner. I think that once is all said and done, she will like it. The kids are very excited. They can't wait to go for a rid around the neighborhood in the side car. I can't wait to take them for that ride. I had hoped that the Vespa would be on the boat by now. Turns out there were some delays and the bike didn't get trucked out until last Friday. Today Bram sent me a picture of the scooter being packed into its box for shipping. Looks like I'll be able to drive it right out the box! I'm one step closer to having my Vespa being placed on the slow boat from China. The wire made it to Bram and he is getting ready to fumigate the shipping container and have it trucked to the nearest port for shipping to the USA. 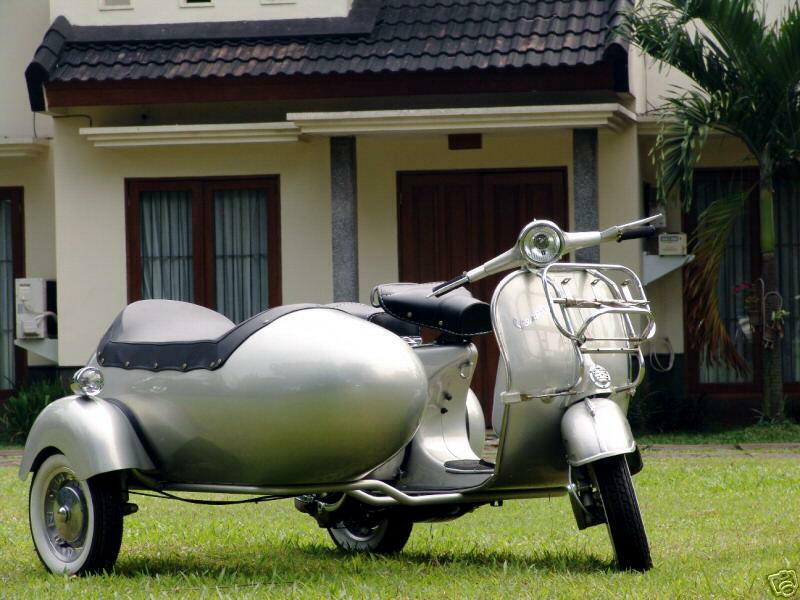 The pictures I am posting are the actual pictures of the scooter. I'm getting pretty excited but I have a LONG time to wait. Once this thing gets on the boat, it will still take nearly 40 days to get to the states. I wired 50% of the payment today. 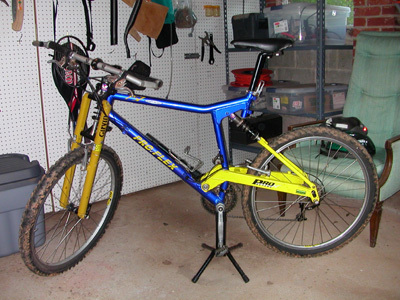 Once it is received the bike will be packed up to send. Of course, it could takes days for the transfer to go through. I have found Bram to be a very responsive person and he is willing to answer all the questions that I have put to him. Communicating with him has put me more at ease.